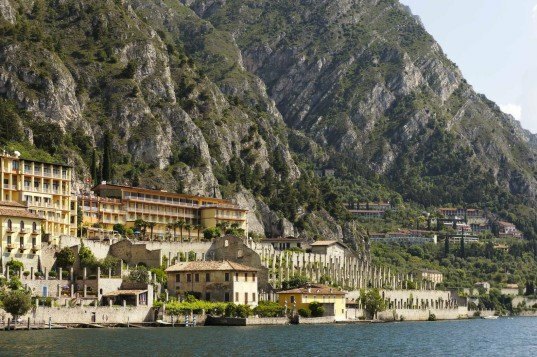 Northern Italy’s glacial Lake Garda has a rich architectural heritage. Now, starchitects such as David Chipperfield and Richard Meier are making their mark on the area, building exclusive homes as part of the 80-million euro Villa Eden development. The design and materials of Chipperfield’s two holiday villas echo the local limonaias, traditional structures for growing lemon trees that dot the perimeter of the lake. The development has been likened to an international art exhibition, with each home a unique work of art. What do you think of this updated take on the limonaia? David Chipperfield Architect’s design consists of two buildings thoughtfully placed within the olive grove and cypress tree landscape. Their volumes are divided into individual one or two storey structures, offset to follow the topography of the hillside. The main building opens up towards the valley with room-height windows. Pergolas with slim columns are placed in front of the volumes, following the rhythm of the surrounding olive groves. The pergolas provide shade from the sun and extend the interior into a protected outdoor space, which leads to terraces with outdoor pools. Material choices were influenced by the location. Stone for the masonry and terraces comes from local quarries. The light roof structure of the pergolas and the window frames are crafted from wood, providing a contrast to the stone. The inner organization of the buildings further reflect the surroundings, with living rooms and bedrooms situated at the front to allow panoramic vistas of the lake and the surrounding landscape. The David Chipperfield Architects designed Turner Contemporary in Margate has been chosen as one of 21 landmarks that define Britain in the 21st century alongside Sir Antony Gormley’s Angel of the North and St Paul’s Cathedral in London. Commanding kudos due to an enviable location and it’s contemporary architectural pedigree mean the Villa Eden properties are selling for between 2 and 15 million euros apiece. Pergola like limonaia structures characterized Lake Garda’s intensive agricultural western shore up until the late 19th century. 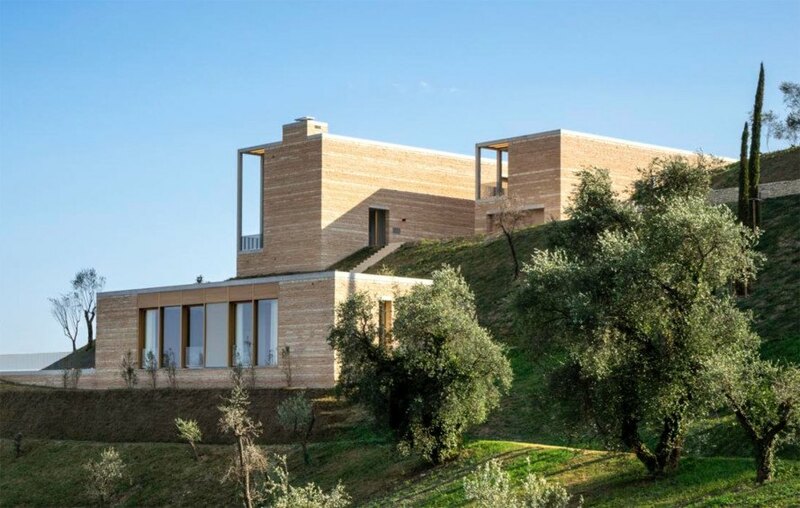 Chipperfield’s design consists of two buildings thoughtfully placed within the olive grove and cypress tree landscape. Their volumes are divided into individual one or two story structures, offset to follow the topography of the hillside. The main building opens up towards the valley with room-height windows. Pergolas with slim columns are placed in front of the volumes, following the rhythm of the surrounding olive groves. The pergolas provide shade from the sun and extend the interior into a protected outdoor space, which leads to further terraces with outdoor pools. Material choices were influenced by the location . Stone for the masonry and terraces comes from local quarries. The light roof structure of the pergolas and the window frames are crafted from wood, providing a contrast to the stone. The inner organization of the buildings further reflects the surroundings, with living rooms and bedrooms situated at the front to allow panoramic vistas of the lake and the surrounding landscape.